From all my previous posts of my model kits you would think that I only do figures! well, that is actually wrong. My first love has been and always will be mecha. And when you mention mecha, one has to mention mobile suit gundam!!! Quite a few, right? well, this is the result of almost 7 years of collecting (I say as though it’s a valid excuse…). Close ups and breakdown of kits after the jump! First up, we have the HG 1/100 series from Gundam wing: endless waltz and gundam epyon and the original altron gundam on the top shelf. 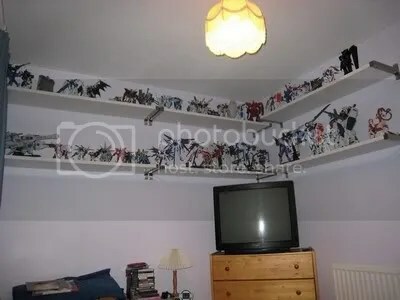 The eagle eyed geeks among you may also notice the 1/100 Evangelion unit 0′ and unit 1 on the left and Tallgeese III just outside the pic on the right. I always preferred the Altron in the TV show over the endless waltz version but it’s the opposite for all the other units. On the lower shelf, we have the 1/144 Gundam seed kits for all the units which had the name gundam attached to it. You can also probably just see strike freedom and Infinite justice on the right. 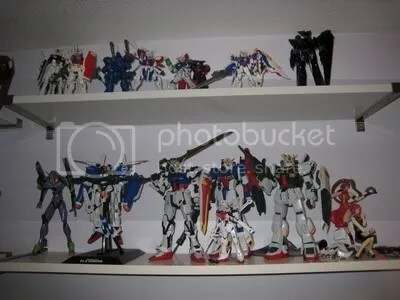 Next up, we have a slightly better view of tallgeese III and the upgraded units from gundam X. Rounding off the top shelf, we have the master grade GP01 fb and GP02 from Gundam 0083 and the Szabi from char’s counterattack. 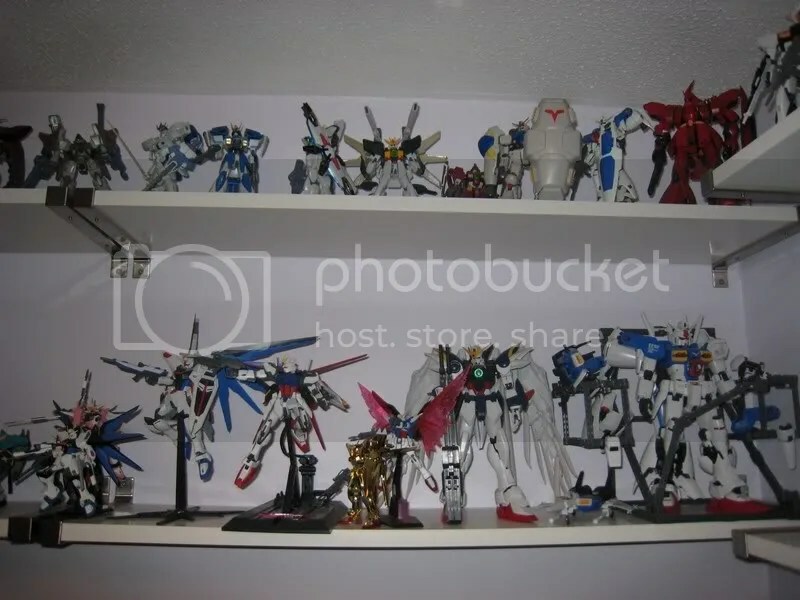 On the lower shelf, we have a clear view of the 1/144 strike freedom and infinite justice as well as Destiny gundam and Akatsuki (not a gundam but bandai put the term on the kits to make them sell more). Sandwiched between the 4 we have the master grade Strike and (my personal fave) freedom gundam. After that, we have the perfect grade 1/60 Wing zero and GP01. 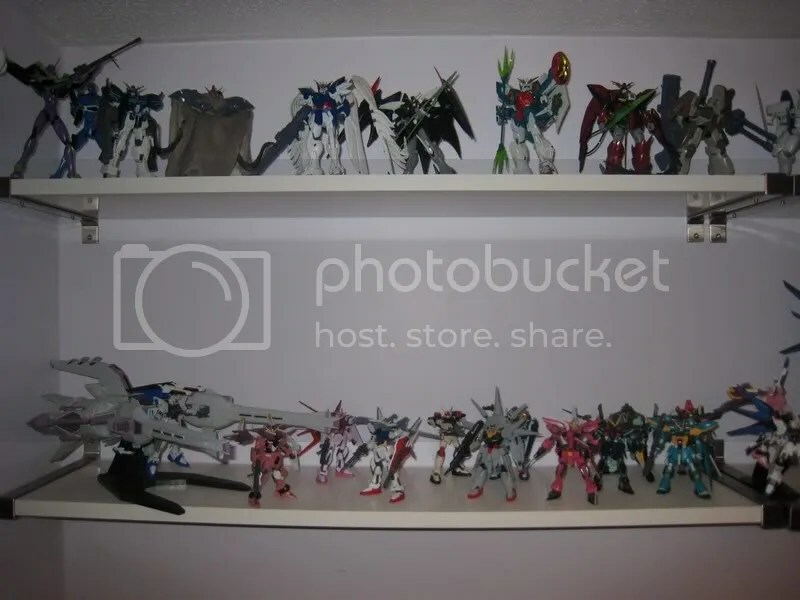 Last, but not least, we have the randoms… On the top shelf we have the MG nu gundam from chars counterattack (did you honestly expect me to have a sazabi and not the nu gundam? ), the original RX-78 Gundam version Ka, MG kaempfer (one of the few decent grunt mecha for the zeon), God gundam (that’s right, I said GOD gundam, not burning gundam like the censored american version of the show called it), Shining gundam and master gundam. Rounding off the top shelf, we have the Wing gundam ver Ka and the griffon from patlabor. On the lower shelf, we have my remaining big kits. From the left, we have the PG Evangelion unit 1, Master grade EX-S gundam, Perfect grade strike gundam, Zeta gundam and Gundam Mk II. Also notice the MG crossbone gundam in front of the zeta gundam. And finally on the right, you can see my Jam kuradoberi and Mizuho Kazami kits which i posted separately. I will admit that I had almost made a mess in my trousers when I saw the PG evangelion as they had been discontinued for a very long time when I bought it way back in 2004. I had a chance to get one in 98 when I was part of my school exchange to Japan. My host family graciously offered to buy it as a gift for me but I couldn’t take advantage of their kindness (that, and I had no space in my luggage to take it home…). I had been kicking myself since then until I happened to chance across one in a small model shop in Hong Kong. I’ve now made a mental note of the location of that shop and they do have some really vintage stuff!!! As for building the kits themselves, I try to do as little as possible to the kits in terms of painting. The reason being, I like the anime TV look of the units which is basically solid block colours and few decals. I try to keep it as close as I can to the anime look, sans weathering and excessive detailing. I do draw panel lines and colours where neccesary though. Especially on the High grade kits (so that would be wing, X and most of the seed kits). but the master and perfect grades need far less work to make them look good so I tend to leave them mostly alone through fear of making them look worse. That doesn’t mean I don’t do anything, however. My Kaempfer is completely painted over since i didn’t like the original green/blue colour it was molded in. But for now I leave you with a little experiment I conducted. Gundams doing the Jinki pose!!!! I was thinking about getting the Gundam Mk II and zeta version 2.0 kits, but then again, I have the PG kits for both so I didn’t see much point in it. At the moment, I’ve still got destiny and Unicorn to build and I will be getting the strike packs. My plan is to have 1 strike gundam for each pack!! Then I intend to get the IWSP conversion parts for my perfect grade strike! Do the unicorn, it is a very nice piece, good looking and it has its destroy mode, but it has as many small parts as an AC kit (trust me I know), the mk II 2.0 is very nice but it doesn’t have as a wide variety of weapons as I’d like, in response to your worry about similarity you could get the mk II Titans ver. just to contrast between your A.E.U.G. mk II. on the topic of your strikes, are you going to do different paint jobs for all ur strikes? because if not u’ll be going through a lot of white paint and they will all look the same( or at least very similar. Oh well hope ur modeling ideas go to plan, seems like you have a lot of resources, having all those perfect grades (6) must have cost a lot! np. long posts are fine too. 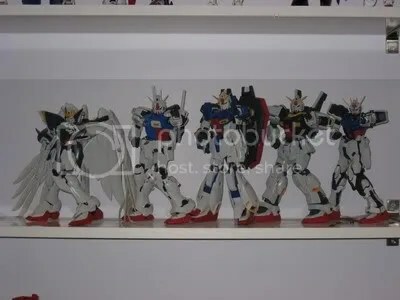 The plan was to do unicorn after I had finished my current works (will probably take a while) but after the rumours of an MG justice gundam started surfacing, I think I’ll do destiny first, just so I can do some of those fight poses! Can you post pics of the modding?, I may do my unicorn too, although i don’t know if i have enough skill to do it, i haven’t really ever done any modding, my self esteem is too low to weather the destruction of my unicorn at my own hands. I was also planning on doing it in pearl white (got the idea from Marvin Ryan) look fairly nice on his site, destiny is an awesome piece although you need to be careful of the hadndle on its laser cannon (excuse my terminology, i don’t know what it is called) i broke mine and its gonna be nigh impossible to replace (along with about $10.00-20.00 worth of replacement sprues for my 03-Aaliyah AC). p.s. you have the full burst version of destiny right? I got the regular version, not realizing that i coulda gotten those cool wings, my mistake. Whats even worse is my store had a couple of them in stock a few weeks earlier (stupid me), I curse myself every time I think about it my destiny, because the butterfly wings are so cool for poses, plus all teh extra stuff. p.s.s./note to self: gotta stop posting so much stuff! I’ll see if I can find the link for the unicorn mods. But basically, they’re self explanatory mods which shorten some parts since they get in the way when you put it in destroy mode due to the shifting parts in the transformation. so you can easily tell what’s stopping the arms and legs from moving. That makes sense to me, although, i feel teh unicorn is okay for posability, even in destroy mode, my one real problem with the uni is the legs, when it is in unicorn mode the legs look a little too chunky to me and teh feet look huge from the front, (still in unicorn mode) from the front the “calves” look way too wide/long and i know that if they tried to make it look better it might hamper durability, but it makes me want to cry because its such a beautiful model otherwise . I still feel kinda nervous doing modding on my master grades, being about $40.00 each, because i’ve never really done any modding on gunpla before, i sand and i use a scalpel and all that, but i’m just afraid of totally ruining my piece by doing large scale mods, kinda setting myself up for failure, huh? i used to put together warhammer 40k figs and when i modded those pieces, i’d go overboard with add-ons and as such ruining the model,can you offer any miraculous advice? Kandy effect, You mean the shiny chrome finish? Can’t say I’m a massive fan of the shiny finish so I don’t think I would do it on one of my own kits. I prefer the more matte finish. As for modding, The best advice I think I could give would be to start small and then add later as necessary. Don’t go into the deep end and change everything at once as that can cause problems later. Best to do small bits at a time so you can see how things change as you go along. If you want to change a fixed pose kit, then plan everything beforehand so you have a clear picture of what you want the end product to be like.and don’t change your mind mid way!!! I just ordered another aile strike and the new striker pack set so I can have all 3 on display. But I know what I’m getting into, having already built the strike previously. You should try the old ver 1 Zeta Master grade. That was a dog to work with!! interesting, the old zetas were really high on my “want list” but are they really that bad? if so ill avoid them like the plague. the reason I’m so annoyed is because i paid 60.00 for the piece, thats a little more than a new PS3 game, i mean come on! weren’t they working on a new version of the strike? This model isn’t that old, it came out late last year, why couldn’t they have held it back and make it a better piece and do you know if the Strike Noir MG uses the same frame? because i love that piece so much, i just haven’t gotten one yet and if it is using the same frame i think me and all the Noir fans are gonna cry. P.S. Do you have a forum we could possibly switch this conversation to? I don’t want to ruin your page or anything. P.S.S. Who is your model supplier, do they give you good prices? I believe the strike noir does use the same base as it’s fully compatible with all the previous (and future) striker packs. The zetas started improving around the C1 versions. It was only the very first one which had major issues. Unfortunately, I don’t have a forum for stuff like this, though I frequent hongfire and dannychoo.com a fair bit. k, truth be told i didn’t cry over the Strike Noir, but its a shame, such a nice piece, wasted on crappy base. The info about the zetas is welcome, i was actually looking at the ones like the C1 (any of the zetas that came before don’t really interest me anyways). Have you taken a look at the site http://www.HobbyWave.com? It seems to be a fairly good supplier, although they don’t take Paypal yet, the prices are better than HLJ (i don’t know) I think and they have a ten dollar flat shipping-rate. FFR (For Future Reference) do you have any HCM, GFF or (E)MSIA figures and are they worth the forty dollar price tag? P.S. I am not advertising for hobbywave so please don’t think I’m some sort of fake user advertising for them or anything. I have a cosmic region Freedom gundam (basically seed GFF) and a couple of MSIA. Personally, I wouldn’t bother with them. The GFF is good for standard posing I guess, but my freedom had a really messy paint job which spoiled the overall look. It’s posability wasn’t much cop compared to model kits either. I guess GFF are worth the price tag for figure collectors, but I like the build process so they aren’t for me. Well thanks, i am kinda skeptical about the not being able to build part, but there is such a variety of GFF figures that were never made into kits, or never came with some specific armament or set of armor, but i do have to say,40.00 a pop is a lot, you can buy better models for the same price… sigh, silly Bandai. A black unicorn would be cool, but if I had 2, I think I would just stick one in regular mode and the other in destroy. Not sure if you all know but the 1/60 PG Red Astray frame is out….WAAAAHOOO. Been waiting for this one for a long time since even the Basic 1/100 HG version is nearly on par with the MG in articulation. Me now get hook on sd clear version E 3 kingdom romance,any1 interested? It’s kind of cute u know. This blog is simply excellent, I assumed I do know a good deal, but I’m so mistaken, like the prior saying the a lot more you already know, the additional you obtain out how small you know. Thanks for the info.